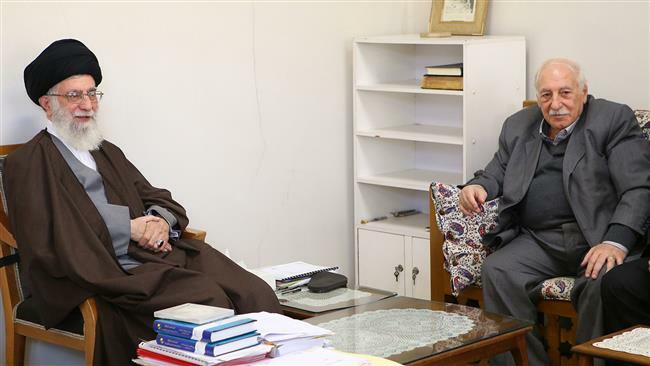 The Supreme Leader described the issue of Palestine as a key issue in the world of Islam. Supreme Leader of the Islamic Revolution Ayatollah Seyyed Ali Khamenei underlined Iran’s determination to continue support for the Palestinian cause until its materialization. “The Islamic Republic of Iran will remain resolved (in its support) until the day that the cause of Palestine is materialized,” Ayatollah Khamenei said in a meeting with Head of Popular Front for the Liberation of Palestine – General Command (PFLP-GC) Ahmed Jibril in Tehran on Monday, adding that youths will definitely see such a day. The Leader reiterated that the issue of Palestine is among top issues of the entire Islamic world. Imam Khamenei further lauded services and efforts made by Jibril in line with the fulfillment of the Palestinian cause. The Leader then called on Jibril, as a person who plays a central role in the Palestinian issue, to maintain his spirit of resistance until the final victory. For his part, Jibril noted that Iran’s 1979 Islamic Revolution has turned the country into an influential player on the international scene, and praised the Leader’s key role in the Islamic Republic’s current progress. He also thanked Iran’s firm and principled stance on restoring the Palestinian nation’s rights.